Members of the cast of Circle Game. Photo by Tyler Branston. Perhaps hoping magic strikes twice, the Firehall Arts Centre follows up its hit based on the music of Leonard Cohen with Circle Game; Reimaging the Music of Joni Mitchell, featuring the music of another Canadian legend, Joni Mitchell. But while Circle Game creators Andrew Cohen and Anna Kuman acknowledge the formula may sound familiar, their show will be a very different experience for audiences. Having grown up with Mitchell’s music, it would be many years later before Cohen would consider the Canadian singer as inspiration for a new show. For Kuman, discovering Mitchell’s music was more organic. It wasn’t until just a couple of years ago when Kuman and Cohen took a closer look at Mitchell’s music, they realized the songs written fifty or more years ago still had something to say. “It snowballed from there, and we began to think about what we could do with the music more relevant to millennials,” says Cohen. Kuman also saw the show as an opportunity to acknowledge Mitchell’s place in music history. “When Andy and I started talking about her music and how influential it was – not only in the Canadian music industry but in paving way for women in music – we knew we wanted to create a show that would bridge the gap between generations, and the gap between theatre and concert,” she says. 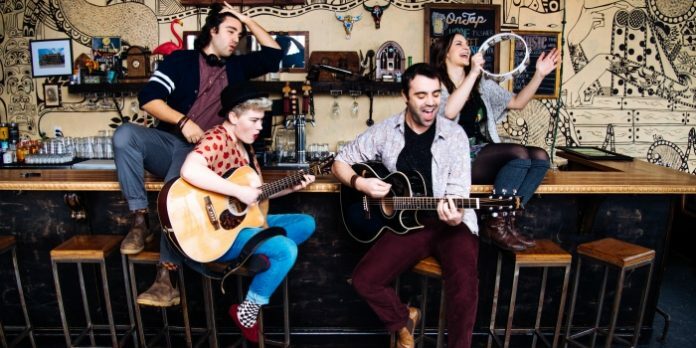 Not a traditional or jukebox musical, Circle Game will feature six on-stage talents who will not only sing, but play a total of eighteen instruments. “It’s not like a Mamma Mia where there is a plot loosely stringing the songs together,” says Kuman. Instead, the duo chose 29 songs from Mitchell’s discography which explore lessons in love, coming to love yourself, and the relationship between the millennial generation and the environment. “The show includes a healthy mix of songs people have heard of and some more obscure ones,” says Cohen. “There is a large indie rock vibe going on with the songs we have re-done, but it is mixed with gospel, blue grass, gypsy jazz, and the like,” says Cohen. For the Firehall’s artistic director it is about having an opportunity to share Mitchell’s music with a new generation. “As I look back on the powerful impact Joni Mitchell’s songs had on the baby boomer generation, I am excited the Firehall will premiere this re-imagining of her music in this production conceived and created by millennials,” she says. Spencer goes on to point out many of the issues Mitchell sang about in the ’60s and ’70s sill remain relevant today. “Audiences will not only be reminded of this, but given the opportunity to enjoy her beautiful poetic lyrics and masterful melodies,” she says. Circle Game; Reimagining the Music of Joni Mitchell plays the Firehall Arts Centre in Vancouver from April 29 – May 20. Visit http://firehallartscentre.ca for tickets and information.